Yo, dude this beer is goddam sick! It's frickin' bad man! Whoop whoop whoop! You da man! Etc. OK translation time before you get the wrong idea. My poor U.S. colloquialisms, believe it or not, are actually trying to state the sheer quality, class, and panache of this colossal and monumental brew. 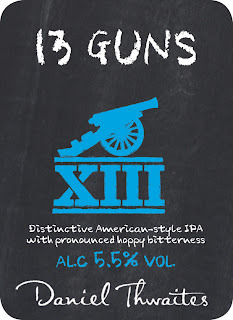 When you hear about a quintessentially English brewery taking on an American 'Style' IPA, you think, "oh dear, I've seen this go wrong before with beers labelled (or rather libelled) as 'American' IPA". This though was SO GOOD at playing our Yankee cousins at their own game, that it was like the Lancashire County Cricket Club winning the World Series Of Baseball. Whilst at the 2012 GBBF (Great British Beer Festival) I had the pleasure of sampling, on cask, a few BIG beers from across the pond. I'd just finished a third of the delicious 'Stone Brewing Sublimely Self Righteous', when friend and beer god, Rob 'Hopzine' Derbyshire lead me excitedly, on a meandering pickled path towards the Thwaites bar. "Oh dear", I thought, "Rob has taken me away from Stones to lead me to Thwaites. He really must have had too many samples." I needn't have worried, for he'd sniffed a real winner out, like a Bloodhound on a promise. 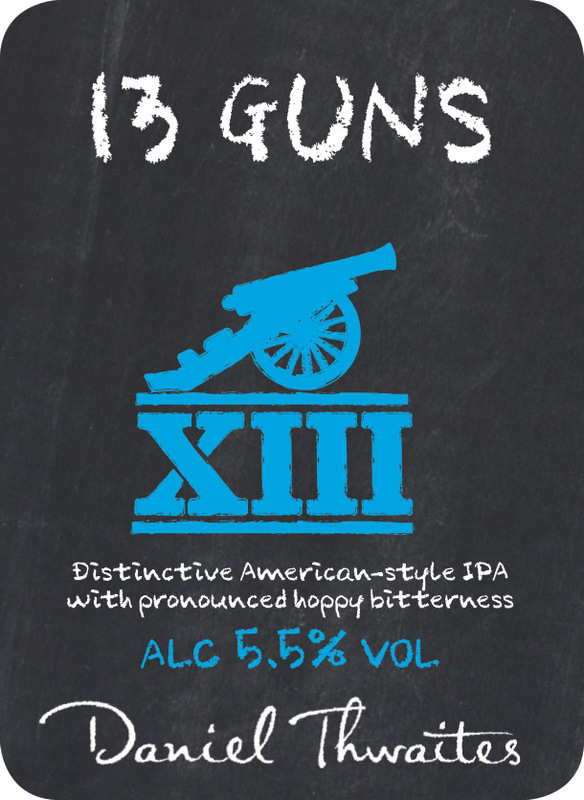 We met with Ian Bearpark (Thwaites Director Of Brewing) who promptly bought us a round of 'Thwaites 13 Guns'. The majority view of the several reviewers, attracted to the news of this beer like bees around sugar, was that this was simply the best beer of the festival. Whilst chatting with Ian, I mentioned that this absolutely MUST be bottled and shared with everyone. The seed must have found a fertile mind, for after a few attempts to perfect the conditioning etc, Thwaites had finally bottled a beer to match ANYTHING in the world. To use an American vernacular, IT'S AWESOME!! Well worthy of a 13 gun salute. Make them magnums too please. Subscribe free to be first with future booze news with the following link.